Moisturizing creams are an essential part of any skin regimen, regardless if you have oily, dry, or combination skin. Keeping the skin moisturized will make it healthier and plumper, and can help slow down the development of fine lines and wrinkles. There are basically hundreds, if not thousands, of moisturizers available in the market. Most of them claim to have the best hydrating effects, and some with added offerings like skin brightening, anti-aging, and some even have sun protection. The product we will review is an honest-to-goodness moisturizer that is very straightforward. It has simple claims: to hydrate the skin and keep it moisturized for hours. Let us check out if it lives with its promise. We heard about the ultra-hydrating benefits of the CeraVe Moisturizing Cream. To see what it offers and if it is worth a try, let’s look into its features, pros, and cons, and then compare it with another product. Essential ceramides: CeraVe contains ceramides 1, 3, and 6-II. These ceramides are vital in making the skin healthy by restoring and maintaining the skin’s protective barrier. Hyaluronic acid: This moisturizing cream has hyaluronic acid, an ingredient that helps minimize visible wrinkles and fine lines by moisturizing the skin and plumping it up. Hyaluronic acid also acts as a protectant that also promotes cell production. Glycerin: CeraVe Moisturizing Cream also contains glycerin, a humectant that draws water deep in the skin; thus, keeping it moisturized. Moisturizing petrolatum: Commonly known as petroleum jelly, petrolatum is not at all comedogenic as its molecules are too big to enter the pores. Instead, petrolatum forms a protective barrier when applied on the skin, preventing the skin from losing moisture. Nature-identical components: Apart from other skin-nourishing ingredients, this moisturizer also contains cholesterol, which is an ingredient that can be found in the skin and keeps the skin healthy. Capric and caprylic triglycerides: This is MCT oil or medium chain triglyceride oil that is derived from coconut oil. It is now becoming widely known for its many health benefits. Dimethicone: The cream contains this silicone-based ingredient that has occlusive and emollient effects. It helps prevent TEWL or transepidermal water loss or basically moisture loss. It also promotes a smoother appearance of the skin by nourishing it and providing moisture and protective barrier. This ingredient is commonly found in creams and lotions because of its nourishing properties and at the same time can be easily tolerated by most skin types. CeraVe utilizes a patented technology called MultiVesicular Emulsion or MVE. This technology guarantees all the moisturizing agents in the cream are absorbed by the skin a little at a time. This ensures long-lasting moisturization and protection that last for 24 hours. Since it doesn’t have ingredients that can potentially block pores, this product is non-comedogenic. This means it can safely do its job without causing acne and blackheads. CeraVe has a formula that will not irritate the skin. Developed by dermatologists, this moisturizing cream is fragrance-free, oil-free, hypoallergenic, and can be used even on the most sensitive skin. This moisturizing cream is awarded the seal of acceptance by the NEA or National Eczema Association. This means this product meets their criteria and is ideal for people with skin conditions like eczema. The formula is gentle and ideal for sensitive skin. This dermatologist-developed moisturizing cream contains ingredients that do not only nourish the skin but also serve as a protective barrier to keep moisture in. It is made for most skin types and is even ideal for sensitive skin and those who have skin problems like eczema. This moisturizing cream comes in a tub with or without a pump. It is easy to apply and is quickly absorbed by the skin without leaving a greasy feel. To ensure that you make a sound purchasing decision, let us compare the CeraVe Moisturizing Cream with Advanced Clinicals Anti-Aging Hyaluronic Acid Cream. For one, both have hyaluronic acid as one of their main ingredients. This ingredient helps minimize fine lines and wrinkles by giving the skin enough hydration. Like CeraVe, Advanced Clinicals can also be used for the face and body. Both creams also have anti-aging effects, but aside from hyaluronic acid, they have different active ingredients. 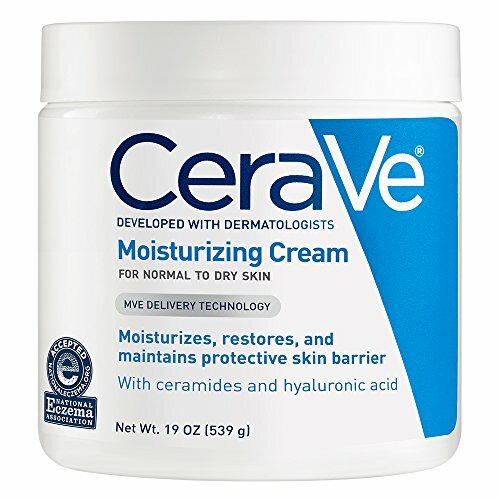 CeraVe has ceramides, glycerine, and dimethicone among many other moisturizing agents, while the other cream contains squalene, borage oil, and vitamin E. In terms of texture, both CeraVe and Advanced Clinicals are thick and creamy, but when applied, Advanced Clinicals seems to get absorbed by the skin faster. However, the skin tends to dry out again after a few hours, versus the moisturizing effect of CeraVe, which can really last for up to 24 hours. Both creams come in similar packaging, which is not very good and hygienic. There are tubs that have a pump, but there are tubs that do not have pumps, and you have to scoop out the product. Based on the comparison, with the moisturizing and plumping effect, as well as the lasting moisture it provides, we conclude that CeraVe Moisturizing Cream is the best choice among the two creams. The cream is a good combination of nature-identical ingredients like hyaluronic acid, ceramides, cholesterol, petrolatum, and dimethicone. It has various skin benefits since it can repair damaged skin, soothe itchy skin, strengthen the skin’s moisture barrier, and keep the skin healthy. It also feels amazing on the skin, as it glides on smoothly, and it is very creamy, but not oily and shiny. It really provides total moisturization that can last for a day and can be used even in highly-sensitive or eczema-prone skin. Using it regularly, it can also give you a youthful appearance. What is more amazing is that it is not only for the face, but it can also be used on other parts of the body where you need extra care and moisture. Overall, it is a good moisturizing cream that keeps the skin hydrated and moisturized. In case you come across with its tub packaging, you can use a plastic scoop or spoon to dispense the product while still keeping it clean.